Why are they called conversion kits anyway? What’s with the many symbols, geek-speak, and technobabble? “6000K”?! What does that even mean? How am I sure the bulb I’m interested in would fit in my car? This LED headlight conversion kit buyer’s guide answers these questions and more. As well as provide concise reviews of the top 5 best led headlights available. The OPT7 FluxBeam is by far the best-selling LED conversion kit, while paradoxically being one of the higher-priced models available. Is it a coincidence? No. Does it mean the product is great? You bet. All you really want to know is what LED headlight is great for you. But sometimes, it can be hard to get past the geeky spec list. To keep it simple, you want a headlight that has excellent performance, is easy to use, and will last for a long time. The OPT7 Fluxbeam checks these boxes and more. The OPT7 FluxBeam like every other headlight bulb on this list offers exceptional efficiency, a 6000K Cool White light that is as close to daylight as you’re going to get, and sufficient brightness of 7000Lm (3500 lumens per bulb). However, where it sets itself apart in performance is its use of OPT7 proprietary Arc Beam technology. The tech combines a carefully shaped and calibrated silicone lens with a high-end CREE (easily the most recognizable auto LED chip brand) MK-R chip. Like a mini projector housing. The result is that you get a very clean, clear, and consistent light beam pattern with no dark spots. OPT7 doubles down on its premium offering with a plug and play system that allows you to install the FluxBeam within 20 minutes. And to be able to do so without any technical knowledge or experience. Inside your package, you’d find all requisite instructions and easy-to-follow guides to get you set up in no time. You can adjust the bulb orientation effortlessly. And because it is CanBUS-Ready, it’ll play nicely with most modern cars. If your car falls in the odd minority of cars that runs into compatibility issues such as flickering, OPT7 also has an add-on TIPM resistor bundle comprising ECM capacitors and flip polarity adapters that should smoothen things up. Installing the add-on kit is a cinch as well. Furthermore, the FluxBeam functions effectively in all weather conditions—rain, snow, or in dusty climate. It is waterproof and dustproof with a formidable IP 67 rating. The FluxBeam will last a whopping 50,000 hours. And a major reason for its satisfying longevity is the outstanding cooling mechanism it is equipped with. OPT7 calls it Modular Heat Protection (MHP). At the heart of the MHP system is a Dual Speed TurboCool fan that makes 7000 revolutions per minute. The fan radiates heat conducted by the expertly built LED assembly with highly conductive materials and a Cold-Pressed Aluminum Heat Sink that reduces heat by up to 35% (a rare component only found in the priciest LED headlights). The brain of the tech is a compact RedLine ASIC-X Control Driver. It has an efficient micro design without the need for mounts. More importantly, it regulates the LED power usage and fan speed for optimal heat protection and performance. The OPT7 FluxBeam lacks nothing. It is a high quality LED headlight basking in innovation and an outstanding feature set at a fair price. For budget-minded LED headlight buyers, the CougarMotor Conversion Kit is an exciting option. For the price, you get quality LED bulbs with the basic features necessary to put in a decent performance. So yea, it doesn’t use a top-of-the-line LED chip and driver, it has no heat sink nor is it built with the latest high-end cooling materials, there’s no proprietary tech like Arc Beam, adjusting it is difficult, instructions could be better, and customer service isn’t as flawless as with the premium brands. The Simdevanma may not be a poster child of auto LED headlight innovation and its spec list may not be the most impressive. However, it covers all the bases with decent features, outstanding performance, and an affordable price tag to boot. Its LED chip may not be a known brand name like CREE, Philips, or LUMILEDS; but it puts out 8,000 lumens, which is sufficiently bright, and the color is cool white (6,000 Kelvin). More importantly, it has an extended throw and no dark spots. It features the standard IP67 rating protection, instant on, and quick plug-and-play installation. Cooling is provided by the use of aviation-grade Aluminum build to conduct heat away from the LED and a 7,000 rpm fan to radiate the heat away. It doesn’t have the driver synchronization feature present in the FluxBeam; but it does have the same standard TWO (2) years warranty and really good support. As such, you can be rest-assured that you aren’t gambling when you choose the Simdevanma because of your budget constraints. If you get a defective product or if your headlight fails prematurely, you get no-hassle replacements timely and customer service is responsive. After taking its home Japanese market by storm, HIKARI makes a showdown with a premium product. It is in fact the first brand to get a Certificate of DOT Compliance. Furthermore, it has a decent cooling system using a 9,000 rpm cyclone dual ball bearing cooling fan and special aluminum alloy shell. It also allows for easy installation, since it is CanBUS-ready. Wrapping it up, HIKARI has superb support and TWO (2) years warranty. For the most part, these functionalities pretty much prove to be worth its price tag. But it doesn’t mean you wouldn’t be missing out on some premium features found in higher-priced models like the OPT7 Fluxbeam. Still, its impressive line of features (including its anti-interference tech), quality performance, and raving reviews indicate that at its price point, there’s nothing better out there. The SNGL Super Bright is the Cadillac of LED Headlights. If you want the absolute best LED headlight money can buy, the Super Bright is the obvious choice. Starting from the exterior, the Super Bright has the best build quality of any LED headlight on this list. It feels sturdy and its durability is not in doubt. In terms of performance, it produces 6000 Kelvin white light with combined astonishing brightness of 12,400 Lumens. That makes it 75% brighter than the OPT7 FluxBeam. And all of that light comes from a bespoke premium LUMILEDS LMZ7 LED chip. Unsurprisingly, it requires 110W for smooth operation. And while its performance is in a class of its own, the heat it emits is expectedly higher than heat from low-powered, lower-priced bulbs. As a result, it’d need the best cooling system to stay consistent and to ensure it hits the over 50,000 hours lifespan mark. SNGL delivers on this regard with an innovative Intelligent Constant Cooling (ICC) system that blows the OPT7 MHP system out of the water. Designed from the ground up to be a custom solution for the Super Bright cooling needs, the ICC system incorporates two latest hi-tech materials in its build. These materials conduct heat superbly to the cold-pressed Aluminum heat sink that improves heat conductive efficiency by 40%. The heat is then radiated off thanks to a high-powered dual ball bearing cooling fan spinning at 15,000 rpm (double the fan speed of the OPT7 FluxBeam). But what really makes the ICC system “intelligent” is the high reliability Dual IC Cool Control Driver. Like the OPT7 FluxBeam RedLine driver, it maintains constant brightness output and synchronizes with the LED ASIC chip to monitor fan speed for optimal heat protection and performance. However, it does a lot more. It has a unique overheat failure protection, fan failure protection—to ensure that the LED bulb can still work even if the fan isn’t working—and electrode reverse connect protection to guarantee anti-interference. Like all LED headlights worth their salt, the Super Bright has IP67 protection to ensure optimal functioning come rain or shine. Installing it is easy, as it is plug ‘n’ play and CanBUS-Ready. And if you own a car known to have issues with the standard LED headlight configuration, you should choose the custom kit with anti-flicker tech. It also boasts the exclusive Adjustable Beam technology that allows you to adjust the LED direction and depth during installation for optimal output. Complete with impressive functionalities, several sizes, and TWO (2) years warranty; the question is not if the SNGL Super Bright is worth its price tag, but if it is within your budget. If it is, then getting the Super Bright is not debatable. However, if its price is too far a stretch for you, the OPT7 FluxBeam would serve you well. LEDs have been all the rage in recent times. From home lighting to even TVs, they’re becoming more ubiquitous by the day. LED is short for Light Emitting Diode. Put simply, LED is a tiny semiconductor device that glows when voltage (electricity) is applied. It’s got several advantages over other types of lighting (which we’ll discuss in the next section). The two common alternatives to LED are halogen and HID (often Xenon) bulbs. And you’re probably asking yourself why LED headlights are becoming so popular. Why would you want to choose it over halogen lights and high intensity discharge lights? In addition, LED headlights are easy to install (it’d typically take less than 20 minutes) and have decent warranty (the industry standard is two years). Car headlights come in different sizes. Therefore, it is crucial that you get the right size that is compatible with your vehicle. If you aren’t sure of the size or model number of your headlight, there are a couple of ways to confirm it. On the Philips website, enter the following details of your car—year, make (brand or marque), and model—to get the bulb size you need to purchase. Halogen and HID lamps are omnidirectional. That’s tech speak for the ability to emit light from the whole glass part of the bulb. LED lamps only emit light from the chip. You’d want to pay attention to the configuration and type (or brand) of LED chip used. CREE and Philips are two of the more popular brands. The brightness or intensity of the light emitted by a bulb (or light source) is measured in lumens (the symbol is ‘Lm’). In general, a brighter LED light will have farther throw. You shouldn’t read too much into the difference between lumen values unless it is significant (say over 1000 lumens). It is the color of the LED light. Typically, LED colors are measured in manometers (nm). However, white color is measured in Kelvin (symbol is ‘K’). Normal color of daylight is 5,600K. And most headlights come in the 5,000K to 6,000K range for headlight color that almost matches daylight. That doesn’t mean you can’t find other colors if you prefer. Many manufacturers offer a diverse range from 3,000K (the ‘yellow’ color that halogen fog lamps typically have) to 12,000K (purple). The consistent performance, high efficiency, and lengthy longevity of LEDs heavily rely on a cooling system. Cooling systems may broadly be categorized into fan and fanless (use copper wires for heat dissipation rather than a high-powered fan) systems. Fan systems run cooler, but fanless systems are quieter. That said, cooling systems have different configurations, with the more complex being in the higher-priced LED kits such as the SNGL Super Bright and OPT7 FluxBeam. While lower-priced models like the Simdevanma use simple systems reliant only on a fan and aluminum build (for good conductivity). Higher-priced kits use high-tech materials, such as copper for better heat conductivity, heatsinks, and a variation of the TSPS (Temperature Sensor Protection System) to regulate the brightness of the LED chip and fan speed. Most LED kit manufacturers market their products to have a lifespan of up to 50,000 hours. Many wouldn’t last that long. But the likelihood of hitting, and sometimes, surpassing the mark increases with better cooling. The reliability of LED headlights is very crucial to its performance and your safety. You can’t afford to have a light going all wonky while you’re heading home on a rainy night. You absolutely do not want to buy a LED headlight without certified protection from the elements. Watch out for its IP (short for Ingress or International Protection) rating or code. You can learn about it here. The IP code is an internationally recognized rating system to verify the degree of water- and dustproofing of a device. The higher the rating, the better. You also want a shockproof LED headlight. This isn’t exactly a feature of LED headlights, but a factor you want to keep in mind before making a purchase. 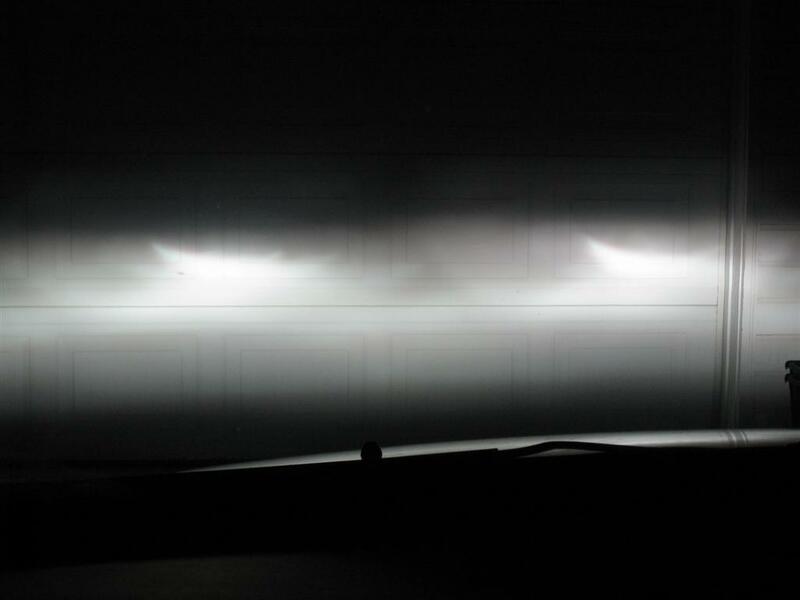 There are two types of headlight assembly in cars—reflectors and projectors. A reflector headlight assembly has a simple configuration. It consists of a headlight bulb situated in the middle of a reflector cup (or housing). Much like a flashlight. Here’s video demonstrating the effect of the cutoff shield in a projector headlight assembly. And here’s the light output from a reflector headlight assembly. Notice how it shines everywhere. As you’d notice from the images above, the core difference between the reflector and projector housings is the lens in front of the reflected light beam. The lens makes the light beam uniform and narrower, which improves the intensity of the light as well as visibility. The cut-off shield doubles on this. As a result, you’d notice that light output from reflector headlights have dark regions (or spot) where there is relatively less light. A phenomenon that is almost nonexistent in projector headlights. That said, the less controlled light output of reflector housings isn’t much of a problem when low intensity halogen bulbs (your stock oem headlights) are used. With high intensity bulbs like LEDs, it can become deeply inconvenient to oncoming traffic. Your light output will not be controlled due to the absence of a lens and your headlights would always appear to be in high beams. As they’d be too dazzling. This is the primary reason why many recommend using aftermarket LED headlights only in projector housings. It isn’t that they wouldn’t work in reflector housings. In fact, many newer vehicles have an Anti-Glare Cap in reflector housings to cut out stray light patterns. However, LEDs generally perform better in projector housings. You want to buy a headlight that is easy to install. Go for headlights that are plug and play and CanBUS-ready. On average, you’d be able to install them within 20 minutes. Adjustments may be necessary. Some cars such as models from Dodge, Jeep, BMW, and Chrysler (and others) sometimes aren’t compatible with CanBUS-ready kits right out the box. As the headlights will flicker or not work correctly. The workaround is to get flip polarity adapters or ECM capacitors for a better connection. Most headlight manufacturers will have an add-on adapter kit available for purchase. LEDs are highly reliable and should last for more than 5 years. Which is why manufacturers have no problem offering decent warranty of between 1 and 3 years. Two years is the standard for quality manufacturers though. In general, higher-priced LED headlights have the best build, premium features, innovative technology, exceptional performance, excellent cooling, and superb support. But if you are on a budget, you may still be able to get a decent buy only if you do your due diligence. Ensure a headlight ticks all the boxes that are important to you, proceed to compare and contrast features, and read what others have to say about the product. Here’s the first question you’d ask yourself after making the switch to LED highlights. “Why didn’t I do this sooner?” They are unarguably better than halogen headlights. They are able to shine brighter, are more efficient, and last much longer. To enjoy all the benefits that LED headlight bulbs have to offer, it is vital that you buy the best LED headlights conversion kits. And for most people, the OPT7 FluxBeam LED Headlight Kit is an excellent choice.